In an interview with BT Sport ahead of the second leg of Real Madrid’s Champions League semifinal against Man City, Zidane was asked about his recent streak of trouser trouble. During each of his club’s two previous European matches, Zidane tore his pants wide open, prompting the unusual question about the fit of his clothing. And though he admitted that he wasn’t able to change his tailor, he did make a significant adjustment. In those roomier pants, Zidane made it through the match without a problem. 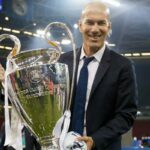 Perhaps the greatest success during a night in which he led Real Madrid to the Champions League final just five months after taking over from Rafa Benitez.